This morning I called my domestic worker from my MTN phone. Her phone is very basic. I can do SMS messages and not much more. She is illiterate, so she cannot read SMS messages. My first concern is that clearly my domestic does not have the capability to type out the message, let alone send it as an alert style SMS instead of a standard SMS message. Thirdly, 46163 is not a short code registered with WASPA. But my biggest question is: who gave the operators of 46163 the network capability to monitor calls to and from my phone, and to and from her phone? 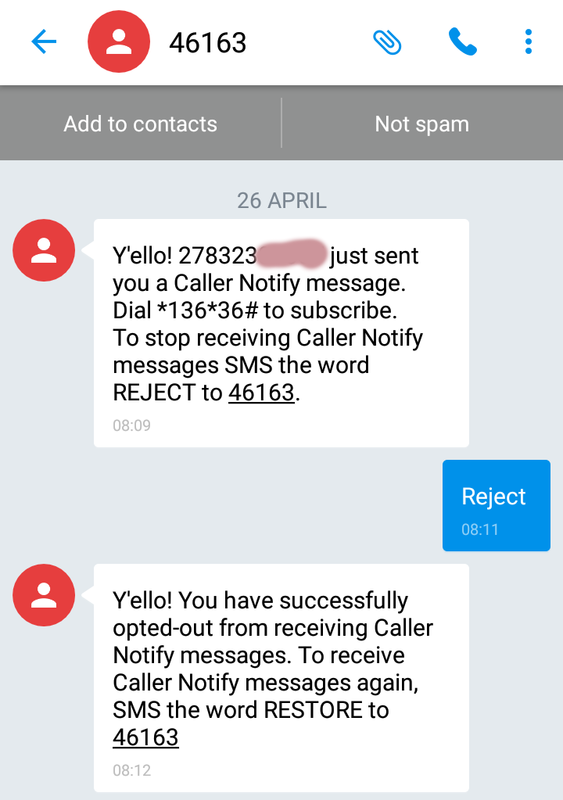 I should also point out that I am the account holder of both phones and at no point do I recall permitting subscription services to be deducted from her phone, or have I given MTN permission to give calling metadata to anyone, and that it should only be used for the purposes of police investigations or billing. So the privacy and compliance issues surrounding this “service” are of grave concern to me as a subscriber. Please would you explain what is going on? I await their reply with interest, and will publish it as soon as it becomes available. I have called their call centre and discovered that the "service" deducts R2 per month R1 per day from the phone's account. Not much until you consider that she only gets R50 airtime a month. Then it's a big deal. Update Friday 28 April: According to this tweet the call centre was lying. The cost for this "service" is R1 per day, or R5 per week. That's plain daylight robbery. My email has been passed from pillar to post at MTN, but still no one has actually replied. I guess I'll have to wait until Tuesday. So what happened? 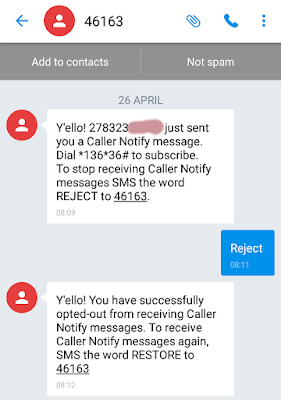 Because MTN continue to SPAM and defraud without any consequences.